Solid, durable brass finish construction and a corrosion resistant high-impact ABS thermoplastic body. 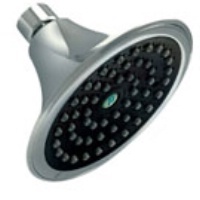 Sava showerheads meets all standards set by the American Society of Mechanical Engineers (ASME). An easy-to-use 360 degree swivel head. Patented non-removable pressure compensator provides a constant output of water regardless of pressure. Extra large 4.4” (113mm) diameter. 360° ball joint swivel for adjustment. Overall dimensions: 4.4” diameter x 3.1” (113 x 80mm).